For low-profile side mount dives in the tightest spots such as wreck or cave exploration, the Dolphin Tech Sidemount SMB-21 complete BCD system with 21 lbs of lift fits the profile perfectly. 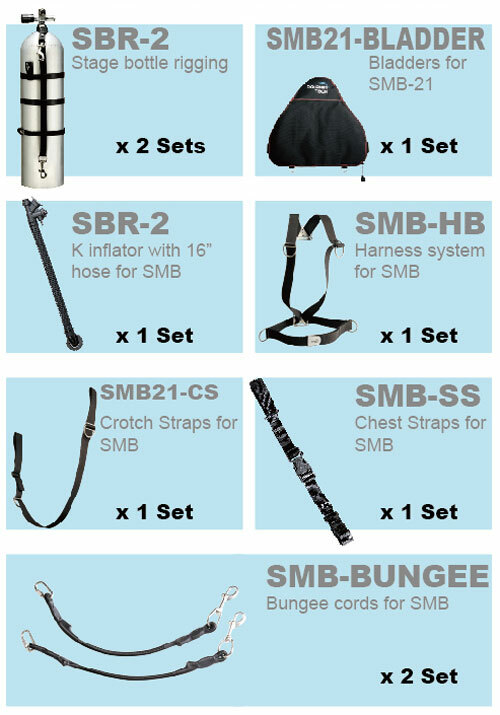 It's a complete integrated system that can be used for warm water diving with wetsuits and aluminum tanks, or cold water diving with drysuits and steel tanks. This side mount BCD setup is the result of hundreds of side mount dives in real world conditions by experienced sidemount divers and cave explorers. The Dolphin Tech sidemount BCDs are low profile, streamlined buoyancy devices, which provide maximum balance and ideal trim control. With the Dolphin Tech Sidemount 21 BCD system you move through the water easier and more efficiently. The Dolphin Tech Sidemount 21 BCD system is completely scalable from single tank recreational to double tank technical, and includes components that are even compatible with back mount diving. The minimalist harnesses also give more chest room for easier access to attachments and better maneuverability underwater. The Dolphin Tech SMB-21 is constructed of armor-like 1680 Denier Nylon with a coating of TPU fully shielding them from abrasions, tears or punctures. The Dolphin Tech side mount systems give divers the flexibility and the durability they need for diving in tight spaces.